Chipotle announced Monday that the chain will no longer serve food containing genetically modified organisms (GMO), raising the bar for transparency in the United States, where there’s no requirement to indicate the presence of GMO ingredients on food labels or in restaurants. Likewise, biotechnology companies aren’t required to report which genetically modified seeds are used in production. Yet the use of GMOs is undoubtedly widespread. 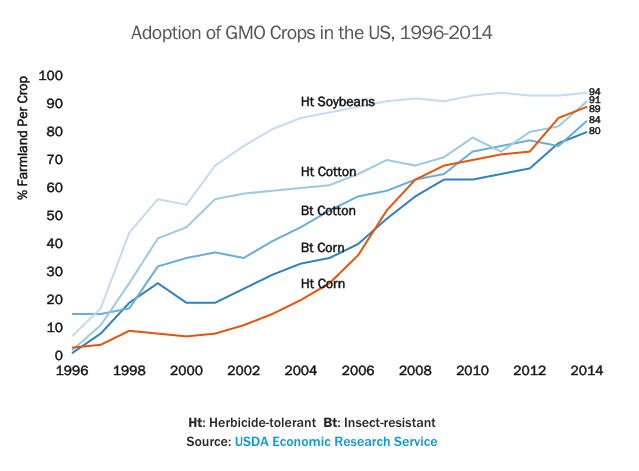 Since GMOs were approved for commercial use, and then first planted into U.S. soil in 1996, their production has increased dramatically. More than 90% of all soybean cotton and corn acreage in the U.S. is used to grow genetically engineered crops. Other popular and approved food crops include sugar beets, alfalfa, canola, papaya and summer squash. More recently, apples that don’t brown and bruise-free potatoes were also approved by the FDA. GM crops produced in the U.S. are listed at the International Service for the Acquisition of Agri-biotech. Deregulated crops are tracked at the USDA’s Animal and Plant Health Inspection Service.